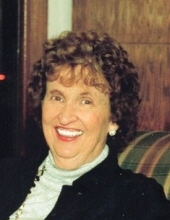 Martha Yost Ridenour of Pikeville, Ky. died Friday, March 29, 2019. She was born December 19, 1930 in Pikeville, the daughter of W.E. Yost and Maude Cline Yost. She was a descendent of 2 pioneer families who settled in Pike County after the Revolutionary War, the Clines and the Yosts. She was a granddaughter of Perry A. Cline, who was the sheriff during part of the Hatfield/McCoy feud and later was the State Representative who sponsored the bill that provided education for the blacks of Eastern Kentucky, The Perry A. Cline School was name for him. She was also the granddaughter of J.E. Yost, the first President of Pikeville National Bank, now Community Trust Bank. He was also a retail merchant whose family owned and operated a steamboat company that ran on the Big Sandy River. She attended Pikeville College Academy and Sweet Briar College. She married Jack Douglas Ridenour in 1949 and moved with him to Memphis, Tennessee where he was stationed during the Korean War for 3 years before he was sent overseas. During those years in Memphis, she worked as the head comptometer operator and book-keeper for the main headquarters warehouse of the Western Auto Co.
Later they lived in San Diego, California before returning to Pikeville. Her only child, Maude Suzanne Ridenour was born in 1956. Martha taught piano lessons and rhythm band at Feds Creek Elementary School for a year and then continued to teach piano lessons in Pikeville. She was a Brownie Scout leader, a Girl Scout leader, a past president of Pi Chapter of Beta Sigma Phi sorority, a past member of the Board of Trustees of Pikeville Public Library, a past member of the DAR, and the Ky. Historical Society, served as a trustee for 8 years and an elder for 4 years of the Presbyterian Church, a past member of Green Meadows Country Club and a member of a bridge club. She established the Ridenour Dance Studio at Pikeville College in memory of her daughter, Suzanne, who had been one of the Dance Kats that performed at the UK ball games and later she taught dancing at Pikeville College before her death in 1994. Martha was preceded in death by her parents, her only brother, William Yost, her husband, Jack Douglas Ridenour and by her only child, Suzanne Ridenour. She is survived by one niece, Nancy Yost, one nephew, Bill Yost, 3 great-nephews, Roger Dale Yost, Eddie Yost and Christian Caudill, one great-niece, Shawn Webb and several great-great nephews and nieces. To send flowers or a remembrance gift to the family of Martha Yost Ridenour, please visit our Tribute Store. "Email Address" would like to share the life celebration of Martha Yost Ridenour. Click on the "link" to go to share a favorite memory or leave a condolence message for the family.